With 2012 coming to a close, various organizations and entities are putting up their "best of the year" lists and this morning's Guardian Guide managed to pay homage to a Korean song other than Gangnam Style. 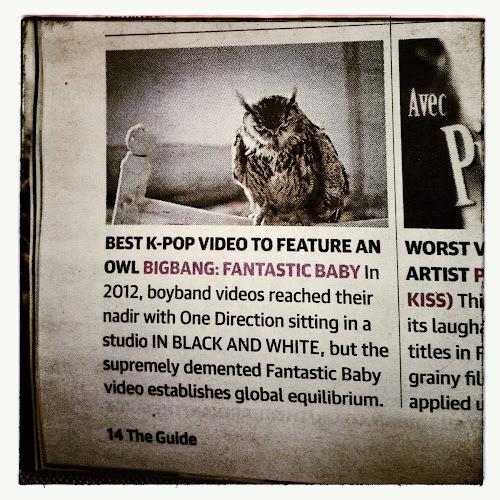 "BEST KPOP VIDEO TO FEATURE AN OWL - BIGBANG: FANTASTIC BABY"
Bigbang's Fantastic Baby may be a bombastic boneheaded beast of a ditty, but the video is quite impressive and does indeed benefit from the inclusion of an owl. I, for one, congratulate Mr. Dragon and Mr. Top on their efforts to include these feathered friends within the realms of Korean popular music and I hope that in future all Bigbang videos may feature winged specimens alongside their semi-naked muscular selves.